We’ve finally made it! The premiere of Gotham’s second season! I hope you’re all just as excited as I am to see what the new season has in store. But before we delve in, I want to remind readers that Gotham contains adult content, and viewer discretion is advised. Content/trigger warning for violence, language, sexuality, and sexual abuse. We begin about a month after the events of last season’s finale. Jim Gordon has been demoted to being a traffic cop. One day, he is forced to defuse a hostage situation when a mentally unstable man who calls himself Zaardon the Soul Reaper (who has secretly been taking a serum from the series new villain, Theo Galavan) starts causing trouble in the streets. Jim ends up shoving his new partner, Officer Franks, when he is uncooperative during the emergency situation. But Gordon manages to bring Zaardon into the police station safely. Officer Franks reports Jim for shoving him, which Loeb uses to dismiss Jim from the GCPD despite Essen’s protestations. Before leaving, Jim threatens Loeb one more time. In jail, oddly colored fumes escape Zardaan’s mouth while he’s sleeping. At home, Lee begins worrying after Jim insinuates he’s going to resort to more drastic measures to beat Loeb. Jim visits Oswald, where he sees Cat attempting to use Oswald to move up in the world. Jim asks Oswald for help in getting his old job back. In exchange, Oswald asks Jim to collect a debt from someone named Ogden Barker in order to prove their friendship is real. Jim refuses. 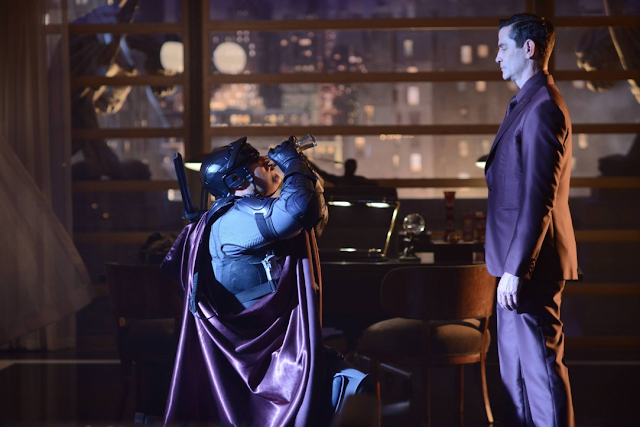 Considering giving the whole thing up and settling for civilian life, Jim visits the bar where Harvey is working now that he’s quit the GCPD. Harvey claims he’s much happier now that he’s no longer a cop. The stability its brought him has gotten him a home, a steady girlfriend, and he‘s even been sober for over a month. Harvey encourages Jim to give up on being a cop since quitting did such wonders for him. Jim visits Wayne manor, where he tells Bruce he’s been fired. He apologizes that he can no longer keep the promise to find the killer of Bruce’s parents, as the only way to get his job back would be to work for Penguin – something his conscience would not allow him to do. Bruce accuses Jim of putting his personal integrity above the needs of the city. Alfred chides Bruce for being rude, and he apologizes. However, Bruce’s words have obviously struck a chord with Jim. Jim decides to take Oswald’s offer after all, and goes to collect the debt from Ogden Barker. Barker refuses, however, and Jim takes the money by force. A chase ensues that results in Jim killing Barker. When Jim brings the money to Oswald, Oswald assures Jim he will ensure no one follows up on the killing. Jim accuses Oswald of knowing the mission would turn ugly, but Oswald denies this. To hold up his end of the deal, Oswald and Victor Zsasz pay a visit to Loeb’s house, and kill his guards. Oswald tells Loeb he wants something done, and Loeb is in the way. He says usually he can use people's weaknesses to manipulate them into doing what he wants, but Loeb has no weaknesses as far as he can see. Therefore, the only thing left he can do is kill Loeb so he can negotiate with his replacement. In fear, Loeb offers to do whatever he wants. But Oswald says it doesn’t matter, as he knows Loeb would only pretend to cooperate and then go back on his promises later once he was in the clear. Loeb continues begging Oswald to give him a chance. As a compromise, Oswald lets Loeb live, and Loeb resigns as commissioner. At the ceremony for his resignation, the absent mayor sends Galavan in his stead to make a speech. Essen replaces Loeb as commissioner, and immediately reinstates Jim. Meanwhile, Barbara Kean flows comfortably into the wing of Arkham Asylum where the most dangerous criminals are kept, and immediately catches Jerome’s eye. Jerome introduces himself to Barbara and starts flirting with her. He tries to convince her to befriend Sionis for her own protection while at Arkham. Barbara instead befriends Aaron Helzinger, flirting with him, and asking him to protect her if anyone causes her trouble. Jerome tries once again to get her to befriend Sionis by saying he runs the place and can get her things she needs. This catches Barbara’s interest, and she barters with Sionis to get a telephone. Once she has her phone, Barbara calls Jim and claims she’s in Arkham by mistake. She says she never told Lee she killed her parents, and that Lee is actually the crazy one. Jim doesn’t buy it and hangs up. When Lee sees Jim acting upset, she gets suspicious. But Jim manages to stop her from answering the phone when Barbara calls again. Barbara leaves a message on Lee’s answering machine, telling her she hopes Lee dies screaming. Scared, Lee says they should go away someplace and never come back. Jim refuses to leave because his conscience won’t ease up about the man he killed for Oswald. The man who calls himself Zaardon is brought to Arkham, where he tells all the inmates to surrender their souls. He suddenly falls onto a table, and the fumes once more escape from his mouth, this time in much greater amounts. The fumes are made of a gas designed to put everyone in the room to sleep. Once the gas has done its job, Theo’s sister, Tabitha Galavan kills the guards and abducts six of the inmates. Barbara, Jerome, Sionis, Helzinger, Robert Greenwood, and Arnold Dobkins are brought to Theo Galavan. Theo tells them they have been chosen for their unique abilities, that their insanity is actually a genius form of creativity, and that he wants to use them to create a team to take over Gotham. Sionis declines and says to stay away from Barbara too. But he also offers to reward Galavan one million dollars for breaking him out of Arkham. Theo is annoyed by Sionis’s rejection, and has Tabitha murder him. Back at the GCPD, Essen informs Jim and Lee that Barbara and some other inmates have escaped from Arkham. Eddie starts hallucinating in the bathroom of the GCPD, seeing his alternate self in the mirror. He begins arguing with this second version of himself, which is urging him to be more firm in seducing Kristen Kringle. Meanwhile, at Wayne Manor, Bruce discovers a metal door inside the secret passageway, but it’s locked. He tries combination after combination on the number pad, but none of them unlock the door. In frustration over not being able to open the door, as well as anger after Alfred has repeatedly reminded him he’s only a child, Bruce smashes the number pad. He decides to build a bomb to break open the door. Alfred tries to stop him, but when it‘s clear nothing will change the boy‘s mind, Alfred helps him build the explosives the right way. The two successfully blow open the door to Thomas Wayne’s secret study. Inside, Bruce finds a letter his father had written to him, in case anything ever happened to him. The letter reveals that the combination to open the number pad spelled out "BRUCE". In the letter, Thomas Wayne says he suspects someone will kill him and Martha soon. He says he used this study to investigate the family company, after becoming a father inspired him to be a better person and look into his suspicions. He says that, since he has no idea what time in his life Bruce will read this letter, there is no fatherly advice he can give except that Bruce can’t have both happiness and the truth. I thought this was, overall, a pretty good start to the season. Not too much happened because it was mostly a transitionary episode to introduce the new format, as well as the very beginnings of subplots we’ll be exploring in the next ten episodes. My favorite thing about the episode was, of course, Jerome and Barbara. I think those two are amazing together, and I hope we’ll get to see much more of their interactions. Despite her being nothing but a dark spot last season, I actually look forward to seeing Barbara now. Embracing her dark side has done wonders in making her character interesting. 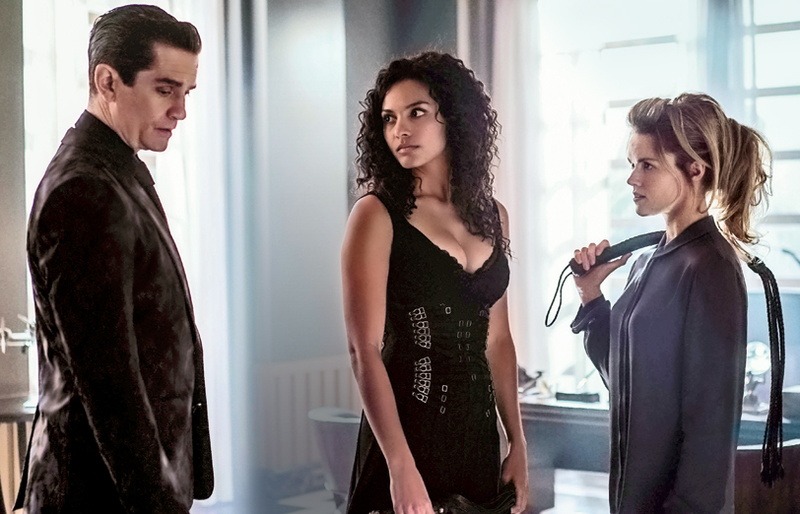 I’m really curious as to why Jerome was so set on Barbara befriending Sionis. It seems like he and Sionis had some plot cooked up together, so I was surprised they killed Sionis off without any revelations concerning that. I look forward to further getting to know the Galavans, as well as seeing the full chaos their team brings to the city. I’m also looking forward to seeing more of what happens to Essen now that she’s been promoted. Now that she’s commissioner of the GCPD, it would be fun to see her interact with Oswald, since commissioners have always made deals with the lead figures of Gotham’s underworld. Some promos, teasers, and sneak peeks for the next couple episodes have been released. Check those out below. After this week’s episode, many fans and critics are wondering if Gotham will be revealing a Flashpoint-esque plot twist regarding Thomas Wayne. Perhaps, as Bruce continues to investigate his father’s secret projects, it will turn out Thomas Wayne wasn’t too far from being a Batman-like figure himself. Scottie Mullen, Harvey’s love interest in the Scarecrow two-parter from last season, will be returning to the show next episode. And since Harvey mentioned this week that he’s living with a woman who does not dislike him, it looks like they got together after all. Several comic book news reporters have been given advanced screenings of the next few episodes. TV Line teases that Alfred and Lucius Fox will interact very soon. TV Line, along with several other sources, also announced that at least two well-known characters will be killed off soon. It’s not known for sure who these characters are, but rumors are circulating they are most likely Sarah Essen and Jerome Valeska. It's believed Essen will be killed during the Maniax raid of the GCPD in tomorrow's episode, and that Jerome will be killed the week after. It's hard to say at this point. But if I had to put my money on one of these, it would be Arnold Dobkins – the only one in the group we haven't gotten to know very well, but from previews, seems pretty unhinged, while also laying low so fans won't suspect him. One popular theory, put forth by comicbook.com, is that Barbara Kean will become a female incarnation of the Joker after being inspired by Jerome’s ideology. I, for one, am hoping the rumors are wrong and that Jerome will live. It feels unlikely to me at this point, but Cameron Monaghan is just so good in the role, it seems a shame to see him throw in the towel after only four appearances. Regardless, it looks from the previews like we'll get to have quite a lot of fun with his character before he leaves. Whether or not he's the actual Joker, the stunts he'll pull on the show within the next couple episodes are so Joker-like, it'll feel pretty much like we're watching Monaghan play a fully-formed Joker on-screen anyway. The guest stars for Strike Force include Carol Kane as Gertrud Kapelput, Anthony Carrigan as Victor Zsasz, Chelsea Spack as Kristin Kringle, Natalie Alyn Lind as Silver St. Cloud, and many more. 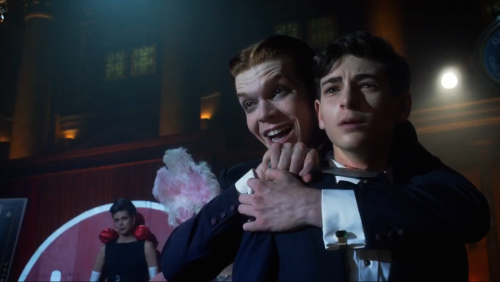 But it must be pointed out that Cameron Monaghan does not appear in the list of guest stars, further supporting the theory that episode three will be the last for his character. Actors Morena Baccarin and Ben McKenzie have announced they are expecting a baby. Many fans have wondered if perhaps the writers will incorporate the pregnancy into the characters’ lives, so that Jim and Lee are expecting as well. But so far, this has been denied. Raul Castillo has been cast as upcoming villain The Flamingo. It has been hinted a love triangle will arise between the Galavans and Barbara.